Home › Home and Kitchen › Chefaith 48-Pcs Reusable Silicone Baking Cups Cupcake Liners Muffin Cups [48 ..
Chefaith 48-Pcs Reusable Silicone Baking Cups Cupcake Liners Muffin Cups [48 ..
TOTAL 48 CUPS - 48 round silicone baking cups packed in ONE set. Bake enough cupcakes at a time, no need to wait for the baking cups washed and then re-bake. 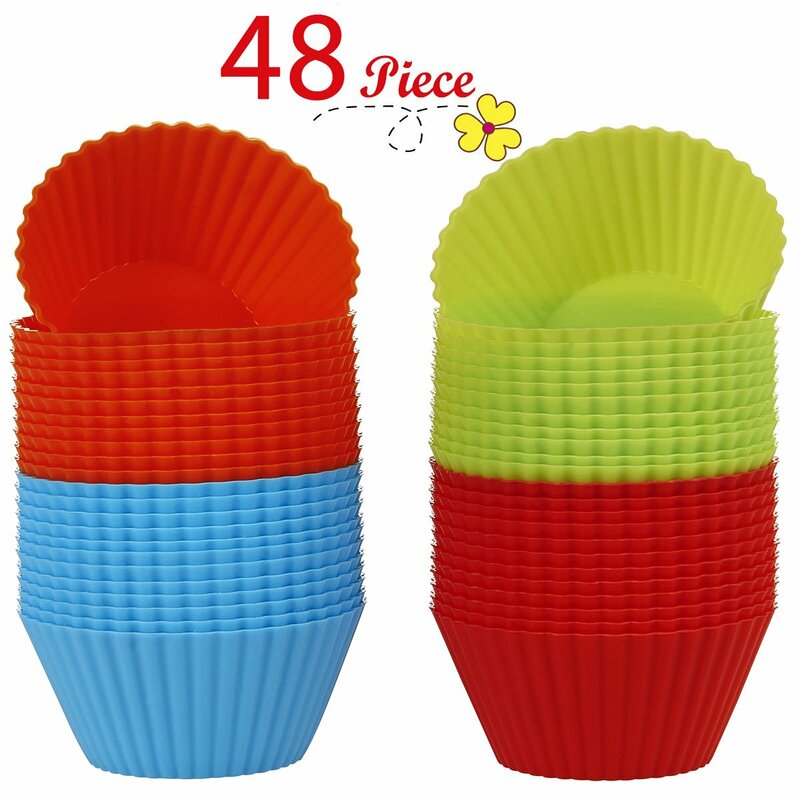 It includes 4 rainbow colors (red/orange/blue/green), 12 pcs per color, your kids would love our baking cups too. PREMIUM QUALITY & ULTRA DURABLE - Made of non-toxic, FDA compliant and BPA free silicone, heat resistant up to 480F, completely safe to be used in freezer, oven & microwave. Our silicone baking cups / cupcake liners are designed to withstand thousands times' usage, totally a money saver! PERFECT SIZE - Each baking cup measures 2.76" dia. (top) x 1.3" tall, and 1.69" dia. (bottom). Standard size and sturdy shape holder - baking like a PRO! EASY TO CLEAN - Non-stick, spotless & odor resistant feature ensures the silicone baking cups / molds very easy to clean. Simply rinse them in warm soapy water or place in dishwasher after use! SPECIAL PRICE - Premium silicone baking cups at this SUPER-LOW price for a LIMITED TIME ONLY. Please search "chefaith kitchen utensil" for other special-offer products sold by Chefaith. Need some fresh fun in your kitchen? Chefaith would be pleased to bring ourSilicone Baking Cups / Cupcake Liners / Cupcake Molds / Muffin Cups to youwhen you're getting bored of daily cooking/baking etc. Why Chefaith SiliconeBakeware? - Non-stick / odor resistant - Elegant color & classic outlook -Dishwasher safe and easy to clean - 48 baking cups with 4 rainbow colors, bakeenough cupcakes at a time! - No BPA, food grade - FDA compliant, non-toxic -Hygienic seamless One-Piece design - no place for bacteria to hide! - Heatresistant (up to 480F), safe to use - Reusable / recyclable, eco-friendly andmoney-saving - Premium quality silicone ensures long-time usage that will lastyears - Best / perfect holiday / birthday gift for your friends and family -Super low price for a limited time only, don't hesitate to save money NOW!Package includes: -12 x Chefaith Green silicone baking cups(round) -12 xChefaith Orange silicone baking cups(round) -12 x Chefaith Red silicone bakingcups(round) -12 x Chefaith Blue silicone baking cups(round) Kitchen is theplace where all delicious food comes from for our families. It's also thesource of happiness in our daily life. When you're hungry, a simplest mealfrom your Mom's hand is literally the most delicious food in the world. Thus,Chefaith would always want to add some cute / attractive / interesting kitchenutensils / gadgets with high quality and affordable prices to your kitchen tosave your food preparation time and make it much more fun! Life is not easy,but we could make it more colorful!